Surface precision Weight balance and hardness are just right I liked it very much. This review is about item#8433774. We purchased at the time of category 10% OFF, but packing has not come. When I bought it at the regular price, I put it in a cardboard box and stopped it with a PP band, and I put a lot of pink paper as a cushion instead. This time it was bare and there were only two pink papers. That is, it was in a state of movement in the cardboard box. Although it is a fragile object with a grinding wheel, this package is not included. It's too bad. Moreover, the label of the handling caution and the label of the crack caution are not attached. There may be more orders than usual, but I'm too open. This review is about item#8434027. I am just satisfied with just good hardness, 255 sizes. This review is about item#8433941. Actually I wanted about # 100, but since this is the only one I bought. This review is about item#8434045. This review is about item#08433826. This review is about item#08433975. Rough correction of the missing saw blade etc. We use it to correct the missing blade such as a circular saw by scraping the tip a little like a taper. Compared to other manufacturer's grinding wheels, when cutting saw blades a little, it is slightly decreasing, but since there is no problem with grinding, it is planned to purchase continuously. 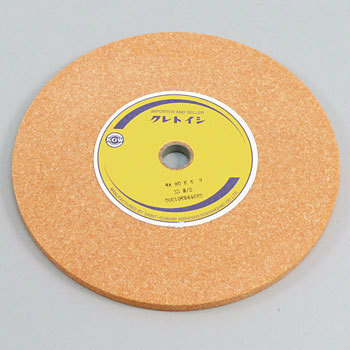 I would like to purchase if there are things that are thinner and harder (outer size 255 mm, thickness 9.5 mm - 10 mm, degree of connection N) if you have nothing particular about the grindstones. This review is about item#08433941. I did not know that until purchase it was made by Crayonton's overseas factory. At the work site, I also gave an opinion that the outer diameter becomes smaller than the previous ones and it becomes impossible to use immediately if I dress it. However, I am satisfied that the use feeling of the product itself is good and I do not complain from the site. If possible, we would appreciate it if you can also make products with the same outside diameter as before. This review is about item#05366734. Since it is a maker item, it was possible to use it without purchase problem. I hope that it is a monotaro brand, more cheap. This review is about item#08433871. I hoped for peelable glue the other day. The area of ​​the paste was very small for the orders this time. Did it correspond quickly? Thank you very much. It is used to polish the spring using the circular part. In order to use a wide surface, I remove the label, but it is difficult to peel off, so I'd like to change it to a glue that can be easily peeled off. The feeling I used is smooth, and the teeth of a thin drill of about 4 mm can also be cleaned beautifully. We mainly use 3.2 mm - 16 mm drills, but we are satisfied as we can make all drill teeth with this grindstone. It's hard not too hard, it's just good for polishing the skin. Since the adjustment ring of the mounting shaft is not attached, it was necessary to machine the shaft. This review is about item#08433792.